The making of a great film includes a clever plot, sound acting, sharp editing and more. One aspect that can make or break a motion picture is where it’s shot: amazing locations stay in our minds long after the curtain falls! Home to magnificent beaches, evergreen jungles and a certain, highly recognizable metropolis, Thailand has graced the world’s cinema screens for decades. An astounding number of independent movies are set in the country, including LGBT+ ones such as Josh Kim’s 2015 ‘How to Win at Checkers (Every Time)’. But it’s the bigger productions that have catapulted Thai destinations onto the world stage. Sound enticing? Visit the below places to step into Hollywood’s footsteps! It is in sultry Bangkok that the crew around Phil (played by heartthrob Bradley Cooper) meet the gangster Kingsley after enduring a whirlwind of harrowing but hilarious (for viewers, anyway!) revelations – chaos quickly unfolds at the Sky Bar at the Lebua hotel. Off-screen, the bar is everything but a gangster hangout. Thai socialites and tourists meet here to enjoy colourful ‘poptails’ (a mix between popsicles and cocktails) alongside the capital’s best views. Located in the Bang Rak business district, Sky Bar is the perfect place to marvel at Bangkok’s skyline as well as the Chao Phraya River. Still, our favourite sight here is the thirty-metre tall golden rooftop dome, majestically perched atop the bar on the 64th floor. You might not have come to shoot a movie, but who says you can’t take a (phenomenal) selfie in the sky? The year is 1974 and a certain Secret Service agent sets off to a tiny islet in stunning Phang Nga Bay to defeat the villain Francisco Scaramanga who has developed a secret technology that must not fall into wrong hands. The name, of course, is Bond – James Bond. In the decades since the film first premiered, Khao Phing Kan (the island’s original name) has become a renowned tourist destination easy to reach from nearby Phuket. Jump on a boat trip around the bay – any local tour operator can sort you out – and step ashore an actual piece of Hollywood history! Bizarre Koh Ta Pu, a twenty-metre tall rock vertically protruding from the turquoise sea just off the island’s coast, is perhaps Phang Nga Bay’s most cinematic sight. Can’t get enough of Bond? Back in Phuket, Patong’s gay bars serve a mean Martini – shaken, not stirred. Thirty years after serving as a prisoner of war during the construction of the Thai-Burma Railway in Kanchanaburi, Eric Lomax (played by Colin Firth) returns to the city to confront his former tormentor, a Japanese secret police officer. 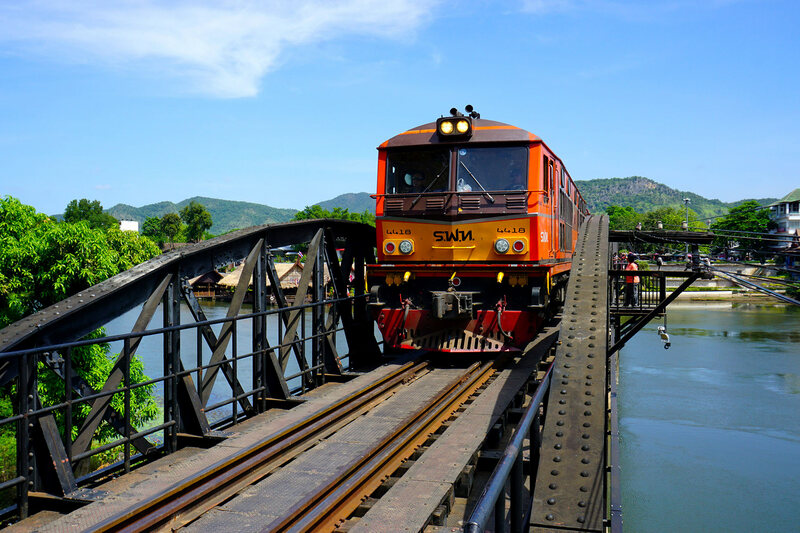 Despite its dark past, the region around Kanchanaburi remains beautiful and ironically, it is perhaps best explored boarding a rustic train! Chug around the province’s lush jungles and laidback villages before passing the 13th century Khmer ruins of Prasat Mueang Singh. Just when most travellers tire of the wooden seats in third class (don’t worry, there are padded ones, too…), the journey concludes in the small town of Nam Tok. While some tourists stay on the train to return to Kanchanaburi, others opt for an equally enjoyable bus journey. Whatever you do, remember to dine at one of the riverside restaurants near Kanchanaburi’s famous bridge on the Kwai River – it’s a sight just like the movies!